As Apple's new iPhones show how important they are to the company, investors want to know how wide the split really is -- -- a lot wider than you think. NEW YORK (TheStreet) –– Since Apple (AAPL - Get Report) introduced the iPhone 6 and iPhone 6 Plus in September, investors and the media have wondered just how much more popular the smaller device would be than its bigger cousin. It turns out the gap is much wider than anyone thought. Research firm AppLovin Data Desk has noted that the iPhone 6 outsells the iPhone 6 Plus by about four to one, with an 80% split for the iPhone 6, and 20% of consumers buying the larger, 5.5-inch iPhone 6 Plus. AppLovin, which processes over 25 billion ad requests a day, found that the 6 Plus is more popular in the Asia-Pacific region, moreso than anywhere else in the world. The iPhone 6 Plus is used on average, 35% more frequently than the iPhone 6 in the region, except for South Korea, which is more in line with the global trend, with 71% of users using the iPhone 6 and 29% of users using the iPhone 6 Plus. 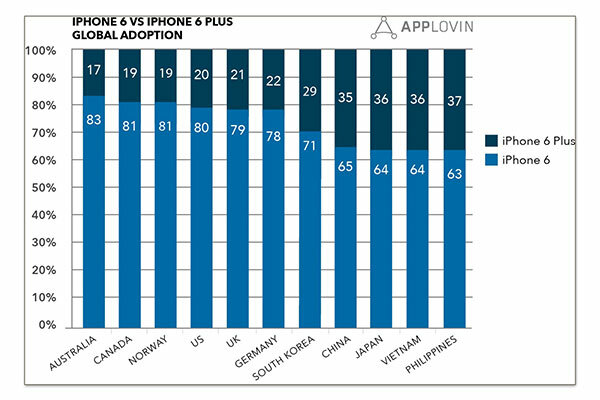 In contrast, data from the Philippines signals the iPhone 6 Plus is used the heaviest there, with 37% adoption rates. Stronger-than-expected adoption of the iPhone 6 Plus in the Asian region, particularly China (Apple's second largest market) benefits Apple in a multitude of ways -- iPhone average selling price (ASP), gross margins, as well as revenue. In the Sept. quarter, when the iPhone was not yet available in China, iPhone ASP was $602.92, significantly higher than the $561.06 in the June quarter. Though some of that is due to new models being introduced, the company's gross margins at 38%, versus 37% in the year ago quarter, help tell the strength of the iPhone 6 Plus. Traditionally, when Apple releases new products, gross margins dip a bit that quarter, and then rise throughout the year as Apple works on getting the cost structure down. The iPhone 6 and 6 Plus made it to China on Oct. 17, available on all the major Chinese carriers, including China Mobile (CHL , China Unicom (CHU - Get Report) and China Telecom (CHA - Get Report) . Apple would be able to sell more iPhone 6 Plus units, but the phone is "supply constrained," according to comments made by Apple CFO Luca Maestri on Apple's latest earnings call. Other regions in the world, including North America, Western Europe and Australia have a ration of the the iPhone 6 and 6 Plus that's "much more aligned with the global average." In the graphic above, Australia has the highest adoption rate of the iPhone 6, at 83%, and 17% for the iPhone 6 Plus. Apple announced the iPhone 6 and 6 Plus in September, and adoption around the world has been extremely strong. In the first weekend, Apple announced it sold more than 10 million iPhone 6 units, and a record 4 million units in the first 24 hours the new iPhones were available. 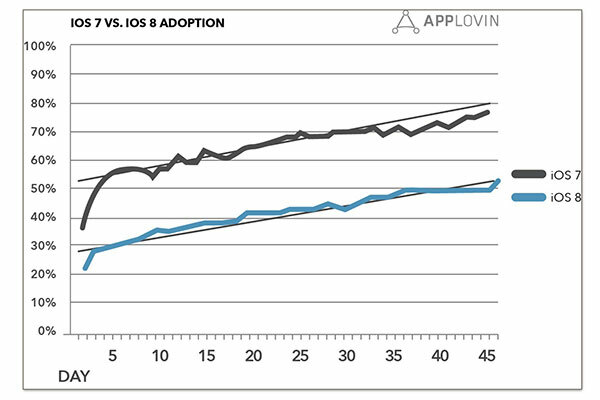 Though adoption for the iPhone 6 and 6 Plus have been strong, AppLovin found that adoption for Apple's new operating system, iOS 8, is a different story. After 45 days of it being released, just over 50% of iDevice users had updated to iOS 8, compared to 80% for iOS 7. Part of that is due to the size of iOS 8, which requires more than 5GB worth of storage available on your iDevice, whereas previous iOS updates required much smaller amounts.